They say the pain of labour melts away as soon as you set eyes on your little one. But, for Florida mum, Amy Bright, this is far from the truth. Fourteen years after giving birth, Amy was still experiencing pain. And no freakin’ wonder! She had a massive epidural needle lodged in her spine. And we’re not talking about a teeny tiny pin prick. We’re talking a three centimetre porker that sends shooting pains radiating down her back and leg. 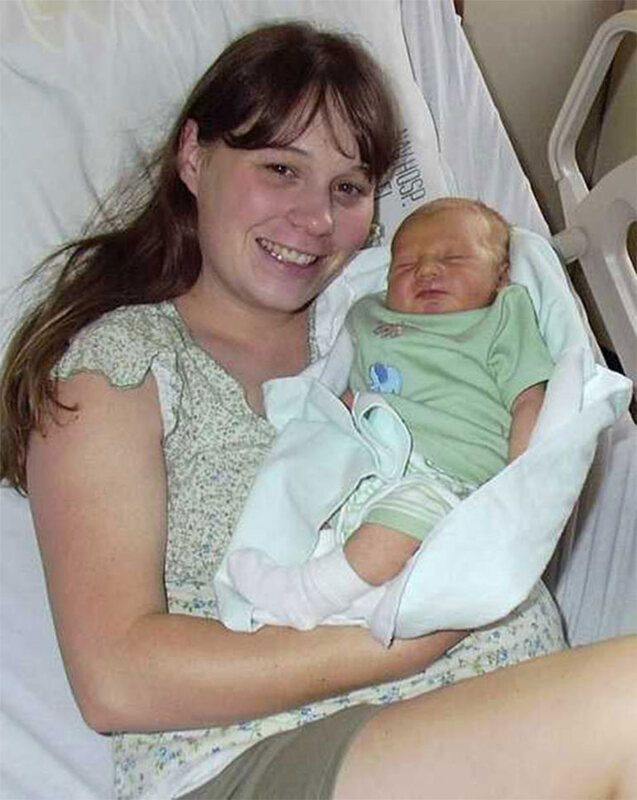 The pain started shortly after giving birth to her eldest child back in 2003. Amy was given an epidural as part of the standard c-section procedure. However, she never imagined she would be stuck with the epidural needle in her spine for the rest of her life. The mum-of-six lived with the pain for several years, relying on pain killers, muscle relaxants and other medications before undergoing a CT scan in 2017. 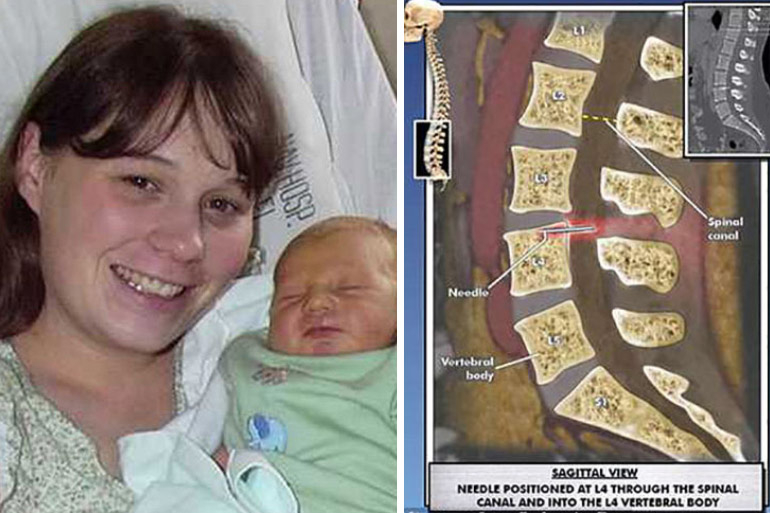 During the scan doctors discovered the entire tip of the needle embedded into her spine. The three centimetre needle is lodged directly into Amy’s spine with two centimetres buried in the bone. Due to the position, Amy claims the needle cannot be removed as it could result in paralysis. It has also been suggested that the pain is expected to get worse over time. 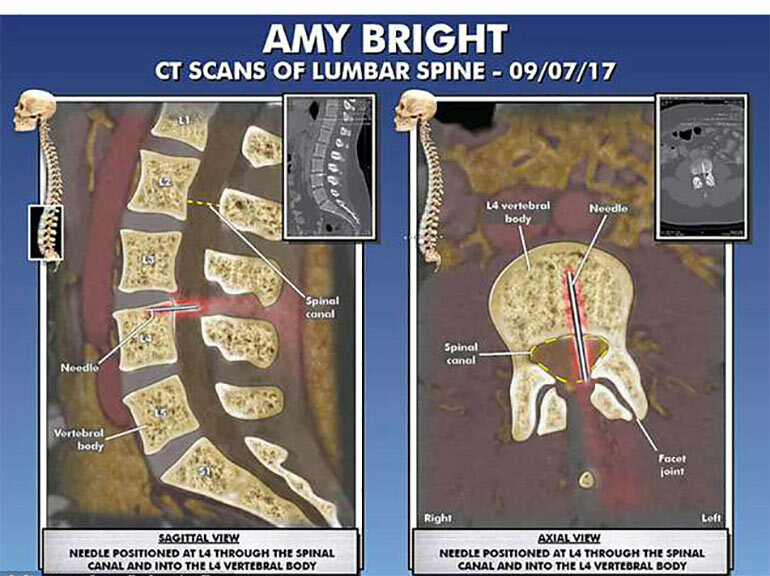 Although it is unclear just HOW a giant needle got trapped in Amy’s body, Amy believes doctors must have known about it and failed to mention it. She has since filed a lawsuit against the federal government for medical malpractice, fraud, and negligent concealment. Although the whole ‘epidural needle in spine’ thing is VERY VERY rare, it definitely makes you think. And possibly consider taking the whole ‘natural birth’ route the next time around. Check out these winning birth photos to help ease you into the idea. And put your mind at ease – after all, not every birth is going to end with a giant needle stuck in your spine. We promise.